Snapping the gap between rhyme and punchline comes NYC's finest, Princess Superstar! Just take a deep one and dive in. The time has come for the genre-bending, DIY hip hop fashionista to flip the underground upside down and dominate the charts with mad hatter hilarity and a voice as smooth as whiskey on crotch. 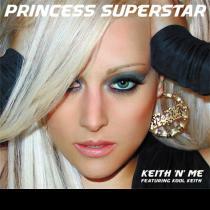 "Princess Superstar Is" touches down on October 8th, 2001 on Rapster Recs. - mark your calendars, call your exes, and get the party started right. Born in a graffiti-covered manger on 172nd and St. Nicholas Ave to a Sicilian-American mother and Russian-Polish-Jewish father, eclecticism was bred in her bones. Growing up in the 70s, Princess Superstar fed herself a steady stream of rock and soul, from Stevie Wonder and Miles Davis to the Beatles and Led Zeppelin. Spending her early years in bucolic bliss on a Pennsylvania farm and then suburban Philly, Princess Superstar's musical foundation was made complete the day she heard Kurtis Blow raining through the radio. As the young royal came of age, like a road movie legend, she headed off to Manhattan, at a tender 17, to drink deep into her New York roots. Princess Superstar spent the next two years crafting her third record, a future-flowing Hip-Hop masterstroke. On her newly minted label, the Corrupt Conglomerate, she released "Last of the Great 20th Century Composers" in the Spring of 2000, cementing her throne in the East Coast indie hip-hop scene.